A traditional, tenanted, farm with spectacular views over one of the largest reservoirs in South Wales provides the setting for NSA Welsh Sheep 2017, to be held on 16th May. The farm lies in the heart of the Brecon Beacons, with grazing stretching towards Pen y Fan, and extends to 1,000 acres. It is the home of Stephen and Lisa Williams and their son, Luke, who at 21 is the fifth generation of the family to farm at Llwyn Bedw, Talybont-on-Usk, Brecon. Stephen’s father, Godfrey, is also heavily involved with the running of the closed flock of 3,500 sheep and the herd of 70 suckler cows. Godfrey, who established a successful contracting business before returning home to farm in 1981, was born the year that Talybont-on-Usk was flooded to supply Newport with water. His grandfather, John Williams, was allocated what remained of the farms in the valley after losing his own to the reservoir. The farm, now rented from Dwr Cymru, comprises 1000 acres under fence, and the family enjoy hill rights on 900 hectares (3000 acres) of Buckland Common, stretching from Aber village to Torpantau. The sheep comprise 3000 hefted Talybont type breeding ewes (Welsh x Cheviot) and a downland flock of Charollais x Talybont type ewes. “We introduced the Charollais to have an earlier selling lamb – we start lambing in the first week of February and finish on 1 May. We lamb them in different batches, beginning with the Charollais lambing indoors. They will have been put to a Texel ram. 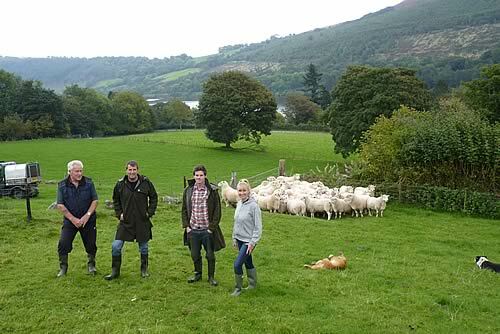 The family are passionate supporters of the livestock trade, with the Charollais x lambs selling at Talybont–on-Usk or Brecon Market from the end of July at 30/32 kilos liveweight and the hill lambs following from the end of August until late November. Any slower finishing lambs are sold at Christmas in Penderyn. The closed flock system involves the family breeding all their own rams, keeping sixty or so each year. The Talybonts are a hefted flock, kept separate and put to a Charollais ram. Their ewe lambs are kept as replacement Charollais x ewes, which then go to a Texel to produce for the early market. The family are looking forward to Welsh Sheep 2017, although since they don’t turn the cattle out until 1 May, it will be a bit of a rush ‘to get sorted’. They take pride in keeping the farm tidy and enjoy sharing their experiences with visitors and so any preparatory work can be done beforehand. Stephen is keen to demonstrate to the general public the part that farmers play in creating and conserving the National Park. He feels there are too many misconceptions. “The perception people tend to have of this area in the Brecon Beacons National Park is that the National Park does a lot environmentally, but it’s we who are the custodians of this valley. We look after the rights of way, the gates and a great deal more. “We deal with people on daily basis. The countryside looks the way it does because of farmers. The sheep are the best conservation tool you can have and we really want the public and see how we operate”. For Godfrey it’s an opportunity to take pride in the part he has played in taking the farm forward. His contracting business, based at his Rhigos smallholding, involved long, hard, hours, including a spell in Aberfan helping to clear the spoil following the tragedy fifty years ago. He recalls that when he was a child in 1947, 3000 sheep out of 7000 were lost in the long, hard winter. There was no way of finding them – he saw birds encased in ice, horses dying against the wall, and recalls cutting down ivy for the surviving animals to eat. He’s confident about the future. Brexit will bring changes, but the family is confident that UK lambs are the best in the world and hope that the Government will recognise and value the work farmers do for the countryside and for the balance of payments. His grandson, Luke, is settled back at the farm, after spending a year on a sheep station near Melbourne. He enjoys working as part of the team with his father, grandfather and mother Lisa, who Godfrey says is ‘the best shepherdess in the area’.